As one of the represents of the generation that matured in the globalized world, Farizwan Fajari, better known as Speak Cryptic, makes distinctive visual language influenced by the cultures of comics and underground music. Dealing with the burning social issues, his narratives reflect his thoughts based on observations on current affairs and everyday situations around him. Questioning the universal symbols of nowadays, the artist asserts the flaws of globalization where the Western model is becoming the norm threatening the existence of other cultures and personal identity of every individual. Fajari was born in 1980 in Singapore where he completed his studies earning the Master of Arts and Fine Arts diploma at LASALLE College of the Arts in 2007. His artworks, from illustrations to graffiti, expose his personality, taste for music, inner thoughts and doubts. 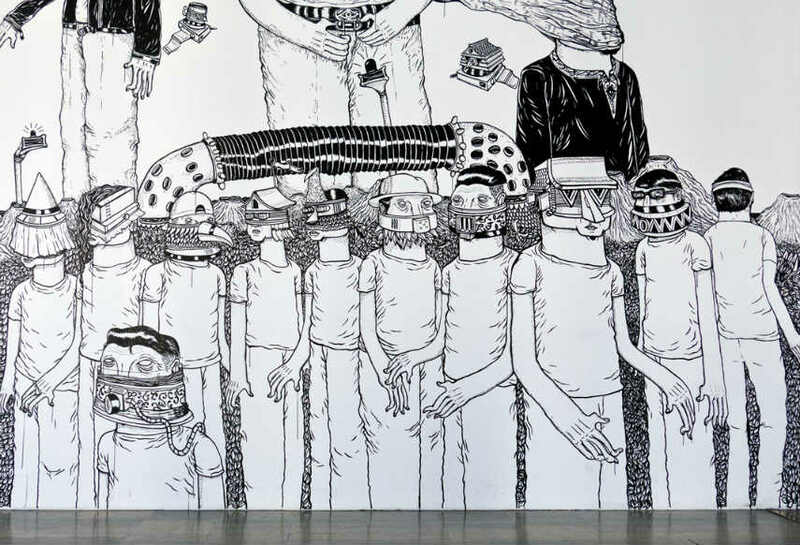 Influenced by fanzines, the hand-made magazines very popular in underground circles before the arrival of the Internet, Speak Cryptic is recognizable for his uncommon style that means implementation of black and white lines with the use of Chinese ink and small brush when he paints over the walls. 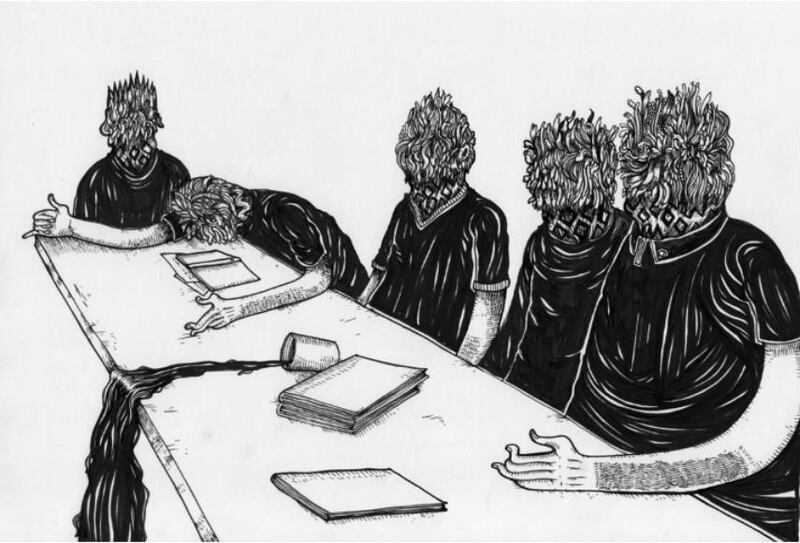 A great fun of rock and metal music particularly bands Fugazi and Meshuggah, his characters often have heads of rockers and punkers, resembling the characteristic portrait of the young people who live in Singapore. In 2015, Speak Cryptic was a part of renewed event Singapore: Inside Out (SG:IO), a traveling showcase that has visited four world cities – Beijing, London, New York and Singapore. With the aim to promote local various creative talents by offering them the possibility to gain international exposure and recognition, SG:IO features a sampling of works, performances, and discussions by twenty artists across different disciplines, from visual, performing, and literary arts to food, music, and fashion. 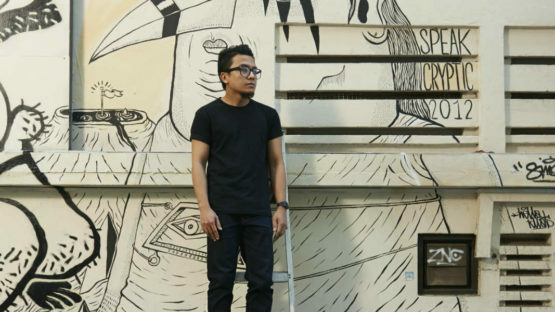 Dealing the issues relating to the cultural identity through his artworks, Speak Cryptic emphasizes, in particular, the Malay people who are deeply impacted by different social circumstances in his country. Accepting the multiculturalism as a fact, he reminds that we can’t relate to just one nation but to all of them, depicting his generation as the one with the lost roots. He creates the effective pieces, often in a life-size formats or larger, from paperwork to street walls and other public spaces. His 3D pieces are made of vinyl from the old records. Since 2005, the artist actively exhibits his works in numerous solo and group shows, including the Singapore Biennale (2013), Future Proof (2012), Budi Daya (2014) and Secret Archipelago in Paris (2015). He plays bass guitar for the Singaporean band I am David Sparkle.